Apple's Mac business isn't growing as fast as it did last Christmas, despite weak comps, but it's still performing ahead of expectations. In a note Monday, Piper Jaffray analyst Gene Munster said he expected Apple to report Mac year-over-year unit sales growth of 26% to 31% for the March quarter, above the Street's expected 22% year-over-year growth. 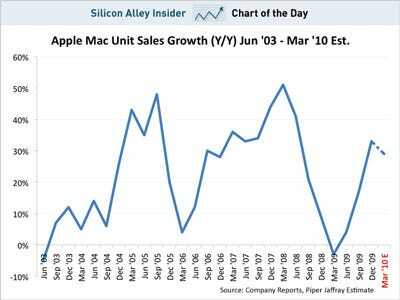 It'll be interesting to see how the iPad affects the Mac business starting in the June quarter. It may attract more people into Apple Stores, who end up buying MacBooks. 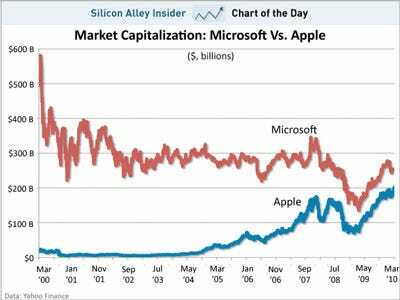 But it could also cannibalise low-end MacBook sales. Apple's bet is that it won't, but will instead become a third category of device, competing mostly with PC netbooks and e-book readers. The only major growth area: Online ad spending. 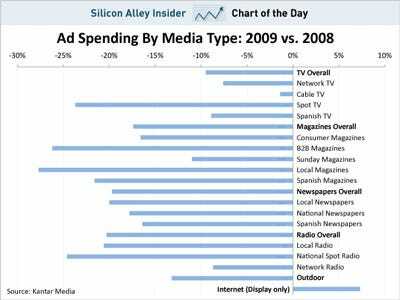 Internet ads -- display only -- increased 7% in 2009, according to the report. Meanwhile, TV ad spending fell 10%, as cable outperformed network TV, and spot spending fell dramatically, as political ads from 2008 weren't around in 2009. Magazines dropped 17%, newspapers and radio each dropped 20%, and outdoor fell 13%. Internet sites love to brag about their unique visitors. The more unique visitors, their story goes, the more the site is worth. The value of a site's uniques depends entirely on what the site does. Specifically, it depends on how the uniques are monetized. The chart below illustrates the value of a unique for several different types of web properties. Not surprisingly, Google's uniques (search) are the most valuable: $18 of revenue per monthly unique per year. Facebook's uniques (social networking), meanwhile, are worth a paltry $3.50. Twitter's uniques are worth almost nothing. To estimate these numbers, we took the full year revenue for 2009 for each of the companies below (owned-and-operated sites only) and divided them by their average monthly worldwide uniques. The bottom line: Search gets the most per visitor, then display, and then social. Specifically, Google gets $18.44 per unique, AOL (thanks to its subscription business) gets $12, Yahoo gets $6, Microsoft $4.42, Facebook $3.09, and Twitter $0.62. 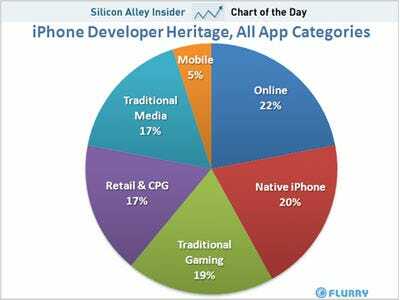 Apple's iPhone App Store is still crushing its peers, especially in the number of applications available to consumers. Apple currently has about 170,000 apps available, according to AppShopper.com. Its next closest competitor, Google Android, has about 30,000 apps available, a company exec recently said. Research In Motion has more than 5,000 apps available, according to the company. 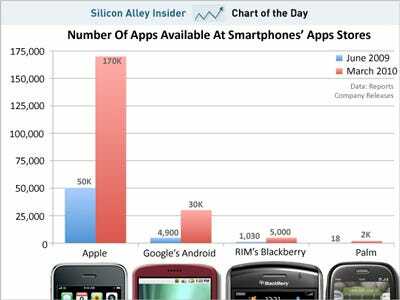 And Palm has 'over 2,000 apps' in its app catalogue, CEO Jon Rubinstein said yesterday on his company's earnings call. Meanwhile, Microsoft's new Windows Phone 7 Series will launch with only a tiny handful of apps later this year. 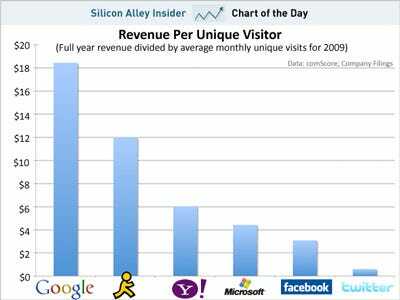 aol chart of the day facebook features microsoft sai-us twitter yahoo!